Well hello there! It's been forever since I've done a post. But rest assured, I've been doing my share of shopping. 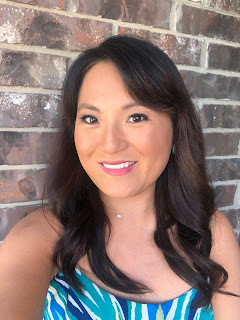 So since most of my outfits have been repeats lately, I figured I post a haul post. So first up. These puppies. I LOVE the Valentino Rockstud Pumps. However, knowing how hard I am on my shoes, I know I would tear them up. And then I would go jump off a cliff because I would just be devastated that I ruined those shoes. So when I found the BCBGeneration Darren Pump I was so excited. They looked so close to the Valentino Rockstud's but I wouldn't feel as bad if I messed them up. My interweb fashion homies originally convinced me to get the white ones. They reasoned that they would be cool to wear during the spring and summer. I wore them for three days straight after I got them. I loved them so much that I just had to order a second pair. I went back and forth on whether to order them. As you can see, my shoe closet is not lacking in shoes with hardware. But I figured these black ones could replace my beloved Ivanka Trump shoes. After all, they are missing a stud. My next purchase has been years of regrets. Back when Nathan was itty bitty, my friend and I trekked to the San Marcos Outlet. We walked into the Tory Burch outlet. I had never tried on any Tory Burch shoes but I tried on some Tory Burch Eddie flats. At the time, they were $99. And they only had them in fuschia. Fast forward to Wednesday when I just moseyed over to Nordstrom Rack after a trip to Whole Foods to stock up on Nathan's juice. The kid only drinks ONE juice. And there is no fooling him. What can I say, he's smart. Ha. So I walked through the shoe aisle. 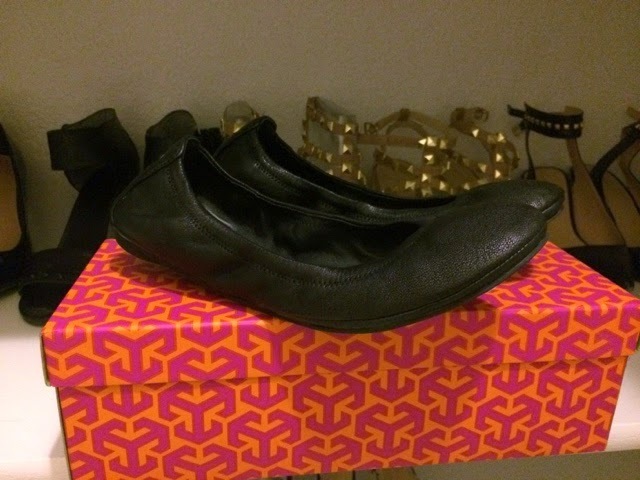 Low and behold I found some Eddie flats in black. They are so comfy. Since my original trip to the outlet, I had tried on the Revas but the footbed wasn't nearly as comfy as the Eddie flats. Plus, I'm not a fan of the huge emblem medallion on the top of the Reva. So I went home and thought about it. I opted not to get them the first time. But this time I was not going to miss out on them. After a quick search on the Tory Burch site and Google I realized that the Eddie flat was no longer available. Well shoot. Now I had to get them. So I swung by on my way home on Thursday and picked them up. It felt like walking on clouds. But the last pair of black flats I bought right after I had Nathan. And have I mentioned, Nathan's now 5?!?! So I've been wearing the same black flats for 5 years. Yikes! Time to replace. Nordstrom Rack is dangerous. I hadn't planned on checking out purses. 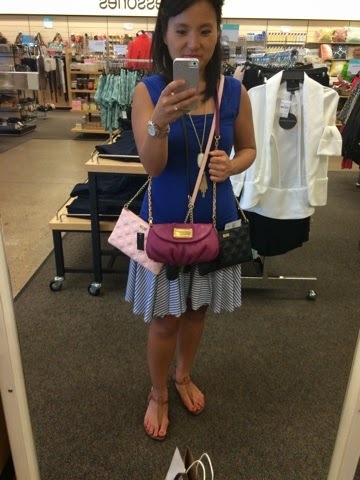 But I blacked out and before I knew it I was holding two little crossbody bags. I really liked them. 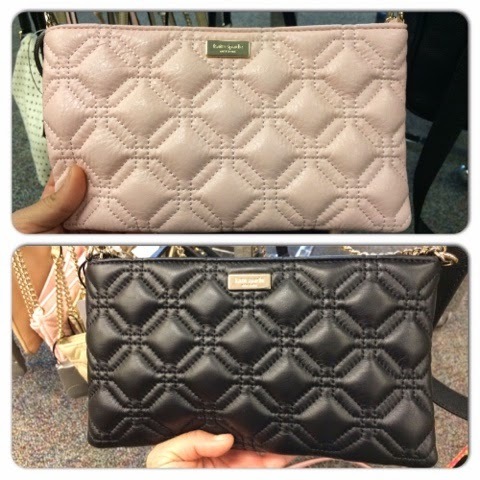 They really reminded me of my Kate Spade Gold Coast Evangaline handbag that J bought me back in 2011. 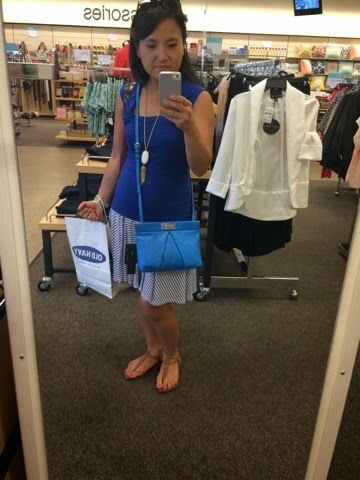 While I love that bag, it's not big enough for work but too big to just grab for date night. And more importantly, just grab and go on the weekends when I'm running around with Nathan. But which color? I couldn't decide for the life of me. So I turned to the interwebz to help me decide. My interwebz fashion homies were split. Half liked the black. Half liked the pink. Tie breaker? J. He liked the pink. So on my way home today, I was going, totally planning on getting the pink one. Until this happened. After my trip to Rack, I wandered over to Old Navy in search of a dress. 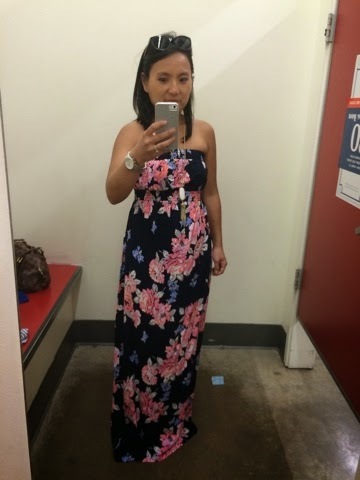 One of the mom's on my local mom's group, posted that she had found a cute floral dress at Old Navy. So I went to investigate. I do have to say that I love the pattern. 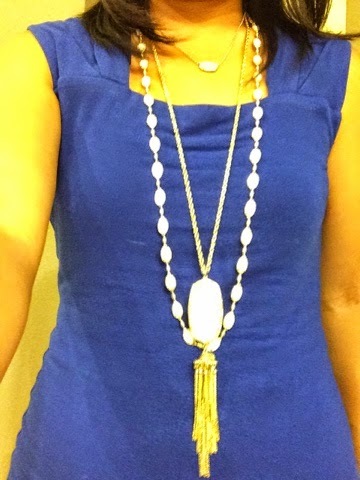 Another piece that I have been drooling over for a while is the Kendra Scott Gale necklace. My friend Katie's husband bought her one for her birthday last August. But at full price it was $140. Even on sale through the Kendra Scott site, it was $100. Until yesterday. I was informed that all sale items were an additional 50% off if you used the promo code CONFETTI. So I tried it and voila. They only had it in white pearl and magenta. I ordered the white to go with my white Rayne necklace. Since we're in the Austin area, I got my order today. I like the layered look of the two pieces. Even though I ordered the size I've ordered bottoms from Lululemon in the past, these were a tad bit tight in the thighs. 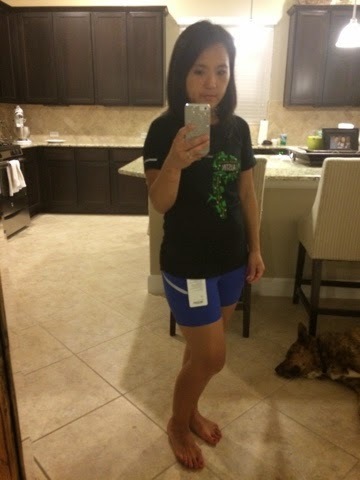 When I ordered my Dart and Dash shorts, I ordered them a size smaller because that was all that was available. But luckily they haven't been too tight. Although, with some recent weight gain, I don't know how much longer I'll be able to run in those. Ha! I also did not like the waistband on these. Unlike all my other Lululemon bottoms, these totally gave me a muffin top. See. 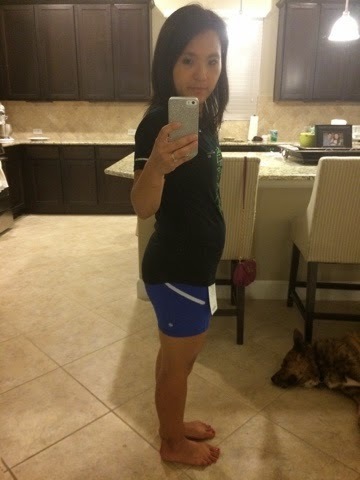 I totally look like I'm 12 weeks pregnant! Ha. I'm debating if I should return them for a bigger size or just give up on them. Thoughts? Well there you have it folks. I've been so busy shopping that I haven't had time to blog. You understand don't you?